I’ve talked about it on here before, but there was a time when I only wanted to run for exercise. I signed up for a half marathon with some work friends, trained, and then only wanted to do that for the next year plus. Prior to that, I enjoyed a combination of running and weight training in my local gym. Today, I enjoy strength training, Crossfit, and strength-inclusive HIIT workouts. By the time I had several half marathons under my belt, I felt my love for running waning. I dreaded going all the way out to where I normally liked to start running, I felt like it would take me forever to get there and back, and no mix of my favorite music would get me as excited as I used to get. Slowly, I realized that I had fallen out of love with running and came to the decision that it was time to let it go. Exercise elicits many different responses from people. Some have completely opposite definitions of what exercise means, some love it, and some hate it. 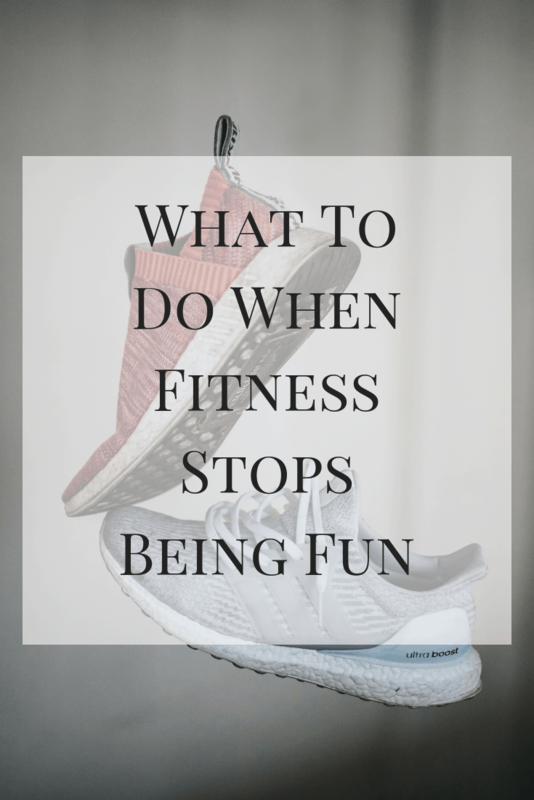 Here are some of my own tips on what to do when fitness stops being fun. Doing the same things over and over again can get boring and repetitive. If you’re always doing the same types of workouts or visiting the same studio classes, you may start to feel burned out with fitness. When this happens to me, I usually take a break. Whether that means a couple days more than normal or a week or two, I wait until I feel the urge to get back into what I was doing. Sometimes this looks like a complete break or just finding a simpler way to move like walking to more places in the city. This works for me because I enjoy working out and I know that at some point I will feel pulled back into it. For someone who already has to force themselves to exercise, however, taking an extended break puts them at risk for losing motivation and stopping altogether. In cases like those, the next option may be more fitting. If your current workout routine is getting boring and monotonous, try looking for something different. If you want to switch up running, try biking or rowing. If you’re a fan of exercise classes, look for ones that are different from those you may have gotten too comfortable with. If you have Classpass in your area, try it out for a month as a way to sample different types of classes. Check out studios or gyms near you for introductory or new client specials. You may be surprised at what you enjoy when you step outside your comfort zone. Sometimes a friend (or friends) make all the difference. While I used to prefer working out alone, now I can’t stand it. I write workouts for clients and the last thing I want to do is write one for myself and then have to do it by myself. Working out with someone else a) helps keep me accountable and b) just makes me enjoy it that much more. I prefer classes for this reason and I have made a bunch of new friends by taking this route! Sometimes having a goal is what you need to keep you motivated and moving forward. Each race that I ran meant that I was training for something specific. My current workout regimen is very predictable, but it’s because we work over time at building strength on specific movements. If I had no goal for some of the periods in my life, I’m not sure that fitness would have been as fun for me. During my addiction, I had absolutely no interest in working out. I would sit on my couch, drink and do drugs, watch TV, and eat Cold Stone ice cream from the carton. When Neil and I were having our issues, I wanted to be out of the house as much as I could and I used exercise as a way for me to work through a lot of emotions that I was having. When I suffered my first big episode of depression here in Chicago, I barely had the energy to get off the couch. My point in giving you these anecdotes is to remind you to always check in with you. How are things going emotionally? How’s life? Are you overwhelmed? Stressed? Anxious? Depressed? Sometimes we get so focused on the superficial that we forget to look deeper. By working on any underlying issues that we may have going on, it may help alleviate some of the ways they’ve manifested themselves in our lives. Some of my best tips for when fitness stops being fun! If you’ve ever been here (and I know we all have), let me know in the comments what has helped you break out of a fitness! I always try and set a goal for myself when I exercise. I find it so much more motivating when I have something to work for! I feel this so deeply! I was OBSESSED with running around this time last year. I was training for my first half-marathon and was enamored with distance, the running community and more. I still kind of am, actually, and one of my fav runners is Kelly Roberts because of her honest approach to the sport. I haven’t enjoyed running lately and I started to feel guilty about it because I “should” be running. Today, some of my favorite workouts are 30-60 minutes of heavy strength + HIIT. I use Fitness Blender a LOT, and I’m loving the results and the way I’m feeling. I really started listening to my body and mind this year, and if I simply do not feel like doing something, I’m not going to do it. Fitness or otherwise. Boom. I can really relate to this! I had ZERO interest in working out after I was cleared to workout post-delivery. I was beyond exhausted and sleep and food were my priorities..not lifting. I like what you said as your last point. Whenever I’m going through a stressful, sad, or more difficult time, I definitely care to workout much less. After becoming a mom, I’ve realized that it’s okay to not workout when I’m completely exhausted. I used to obsess way to much about never missing a monday and all that jazz. But, sometimes rest is best! 🙂 Thanks for sharing these tips! I’ve recently “found a friend” – my 13 year old. She hasn’t been exercising at all recently and I’ve been in a major rut- crowded gym has me annoyed and intimidated from doing what I want, and like you, I think I’ve fallen out of love with running. but I asked her if she wanted to lift weights with me and she did. We’ve been 3 times so far and I’m getting a better workout by doing it with her bc I have to be the one leading the way, and I think it’s going to do wonders for her self-esteem. She’s very engaged and we’ve been having fun together! Omg I love that so much. I’m so glad you guys can do it together – it’s such a great bonding time! This is really what I need now, because I’ve been very lazy this past few weeks… I got bored in what am I doing.. I think I must look now for a workout buddy! Thanks for sharing this article, much appreciated. Your point of taking a break is absolutely right, even I was also recommending the same to my friend, I’m looking forward to more article like this.